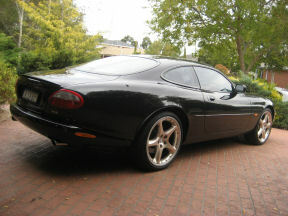 Welcome to my Jaguar XKR web site, all about my stunning Jaguar XKR with R features. 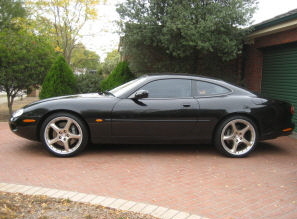 The Jaguar XK8, and the XKR in particular, are simply sensational vehicles and this 2000 model in Anthracite (black metallic) with Oatmeal leather interior attracts more than its share of attention mainly due to its factory fitted “R features”, the stunning 20 inch BBS two piece alloy wheels that hold up each corner and the huge Jaguar branded Brembo brakes peeking through the wheel spokes. Prior to the XKR I owned and restored a 1972 Jaguar E-Type V12. The XKR was Jaguar’s modern reincarnation of the classic E-Type and just like the “E” in its day, it provides a very fast and attractive supercar. However unlike the E-Type, the XKR is quite sophisticated and provides its powerful performance in a quiet and refined package. 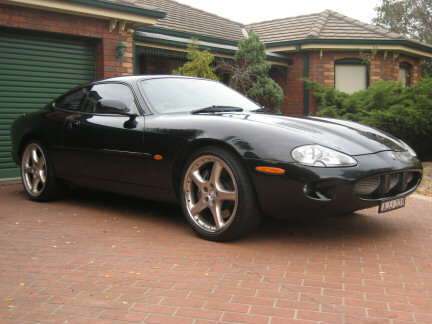 The Jaguar XKR is a pleasure to drive. It’s very quiet, very comfortable, stacked with standard luxury fittings that you expect from Jaguar and it has great road presence - it really stands out from the mundane family hacks and plastic performance “rice burners” that clog our roads. Oh, and did I mention that it absolutely flies! The seamless power from the supercharged Jaguar V8 is simply breathtaking. You can drive it quietly within the speed limits and it behaves just like any good luxury car should - but hit the “sports” mode button, give it a boot full, listen to the whistle of the supercharger as it winds up and you are in for a real treat, well beyond the legal speed limits! The acceleration is nothing short of startling, however it does it so quietly and effortlessly that you have to watch the speedo to comprehend just how fast you are traveling. A real license killer and I am thankful it has cruise control to keep the hi ghway speeds away from the attention of Mr Plod. 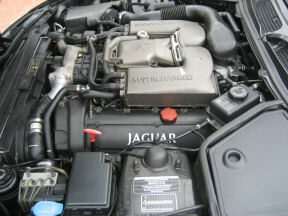 The suspension, handling and brakes are also excellent and Jaguar are to be congratulated on developing such a well balanced package. 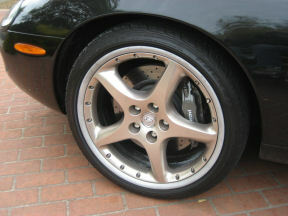 When I first started driving the XKR I was surprised how well it rode despite the huge 20 inch wheels and low profile tyres. I had expected a much harsher and noisier ride but the Jaguar engineers obviously did their homework well and didn’t just bolt on big wheels and leave it at that - the ride is more luxury car than sports car. The XKR is rather big and heavy but the massive Brembo brakes pull it up without effort and combined with the great suspension set up and big grippy tyres this cat really purrs in the driving department. A perfect Jaguar you may ask? Unfortunately not! The cabin is a bit cramped, the rear seats are too small except for dwarfs with amputated legs and when driven hard the fuel consumption can rapidly max out the credit card. But the good points far out strip the bad by a long country mile. The XKR is a superb vehicle that is content to quietly run around the suburbs or rapidly eat up the kilometres on a long country trip. And it's also happy to take a very quick squirt around the race track. For more detailed reviews and opinions take a look at my XKR road tests page and read what the motoring press had to say when the car was launched.